Since "Keep Out" signs don’t work on ants, getting the point across to them can be quite challenging. If ants have invaded your garden, all your hard work is not lost, even though the little pests have you outnumbered thousands to one. 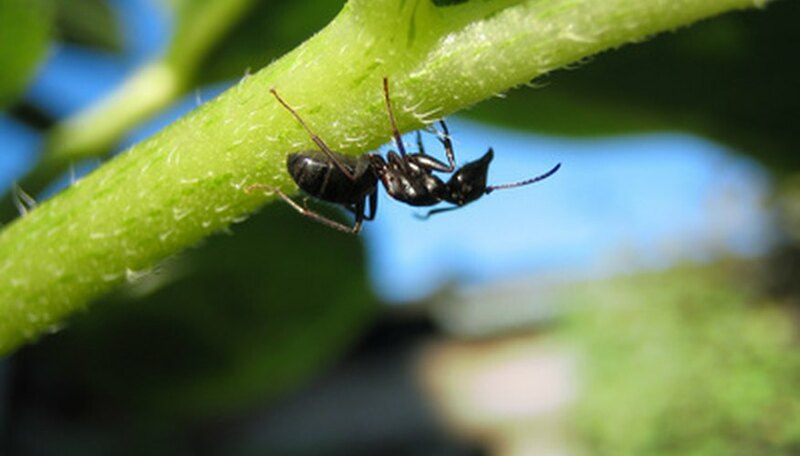 Use these safe, simple and inexpensive methods to give ants the boot and save your garden. Peel cucumbers and drop the peels around your garden. Ants don’t like the smell and will be apt to stay out. Locate their anthill and dig it up with a long-handled shovel. Pour hot soapy water onto the area and mix the water into the ground with the shovel to help it reach down into the nest. The soap will kill many of the ants immediately; the rest will be forced to move on. This may take a few tries before they fully get the message. Mix 1 teaspoon of boric acid into 2 cups of water. Add 6 tsps. of sugar and stir the solution well. Dip cotton balls into the solution and place them into plastic containers. Place the lid on the containers and poke holes in the sides so ants can access the bait. Set the containers around the garden to give the ants access. They will bring the toxic bait home. Slice oranges and drop them into the garden. The ants will swarm the oranges and the birds will pick them up and carry them away. Sprinkle cornmeal around your garden for hungry ants to collect and take home. The ants won’t be able to digest it when they eat it for dinner and many of them will die. If the queen dies, the ants will move on and find a new home. Follow manufacturer's instructions carefully when handling boric acid.